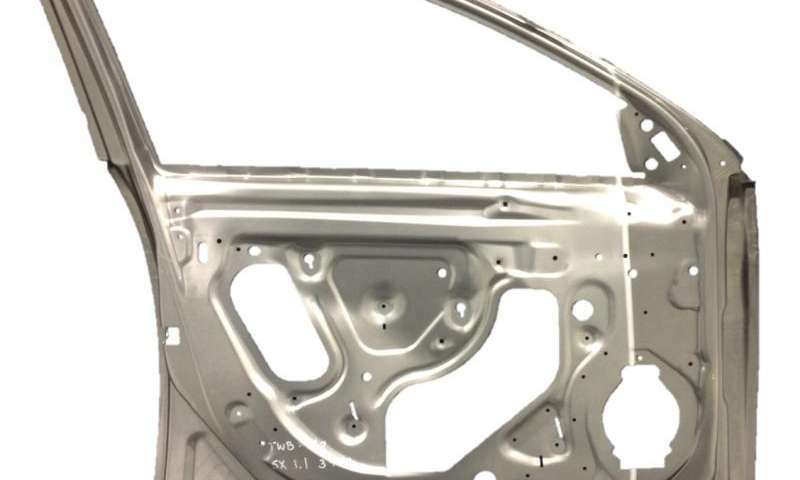 A new high-volume joining process discovered by researchers demonstrates that utilizing aluminum in cars and trucks reduces production time and costs, while yielding strong and lightweight parts. The expanded use of lightweight aluminum can deliver a car door that is 62 percent lighter and 25 percent cheaper at the same scale, quality and consistency required by today’s manufacturing methods in the auto industry. General Motors, Alcoa and TWB Company LLC, researchers from the Department of Energy’s Pacific Northwest National Laboratory have transformed a joining technique called friction stir welding, or FSW, in order to join aluminum sheets of varying thicknesses. The new production process is 10 times faster than current FSW techniques and still manages to produce auto parts that are light yet retain strength where it’s most needed. The two-phase, six-year project is being funded by the Department of Energy’s Office of Energy Efficiency and Renewable Energy with contributions coming from each of the participating companies. With two years of funding left, the team of researchers is focusing on even faster weld speeds, in addition to figuring out the best way to maneuver around the corners of complex aluminum parts. “Going forward, we see this process, and future versions of it, enabling completely novel combinations of materials that will revolutionize material use in the auto industry,” Hovanski said.